(Millbrook, NY) Trees growing in temperate forests in the eastern US show strong adaptation or acclimation to local climate. So reports a new study that analyzed more than 23,000 tree cores to investigate how adult trees respond to changes in climatic conditions. Results were published this week in the journal Ecosphere. Charles Canham, a forest ecologist at Cary Institute of Ecosystem Studies, led the research team, which included several collaborators from the USDA Forest Service. He explains, "By looking at data in tree rings, we were able to reveal how individual trees responded to variations in climate during a roughly 40 year period. There is evidence of pervasive local adaptation." The study analyzed tree rings collected by the USDA Forest Service's Forest Inventory and Analysis (FIA) Program in the 1980s. Cores were taken from trees at 7,010 plots in six New England states (Maine, New Hampshire, Vermont, Massachusetts, Connecticut, and Rhode Island) and the states of Pennsylvania, West Virginia, and Ohio. Fourteen of the most common and broadly distributed temperate tree species – accounting for 23,048 cores – were used to model the relationships between growth and climate. Locations of sampled trees were obtained via the Forest Service and used to extract monthly climate data. The team tested alternate models of inter-annual variation in radial growth – how much trees grew from year-to-year – as a function of age, size, temperature, and precipitation during the period from 1940 to 1984. Models included climate variables from the current and previous year. Alternate models were used to test if growth was determined by absolute climate values or better predicted by deviation from the long-term mean climate at a location. Canham explains, "Trees responded to climate based on deviation from the long-term mean conditions in the location where they were growing. For all 14 species, models that used deviation from the local, long-term mean were superior, with all 14 species showing strong adaptation or acclimation to local climate." For most species, growth was highest in years that were cooler and wetter than the long-term average at a site. The authors stress that more work is needed to determine if trees are exhibiting genetic differentiation, phenotypic acclimation, or some mix of both. Adaptation based on genetic diversity within a population could render trees in a given location more sensitive to climate change than expected. Conversely, acclimation arising from phenotypic plasticity, or an ability to adapt to the local environment, could make species more resilient. "These tree species have been around for tens of millions of years. But the pace of climate change that we anticipate is faster than anything any tree in one location has seen during its evolutionary history. We need to know – is the future pace of change so fast that it will swamp either of these mechanisms?" 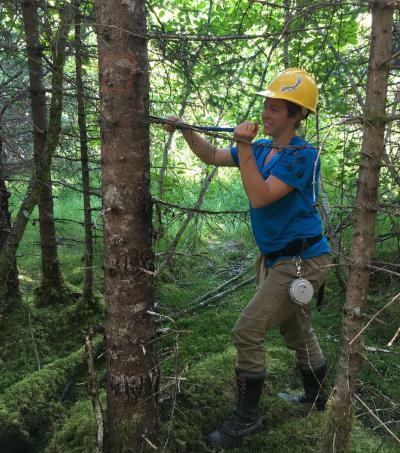 Canham hopes that younger scientists will team with the Forest Service to replicate the study using more recent tree cores, noting that between 1940-1980 year-to-year fluctuations in temperature and precipitation were "in the period before the recent rapid change in climate." The bottom line: "There is no simple takeaway. Based on these cores, trees are cleverer than we give them credit for – but we don't know how they are pulling it off or if they can keep pace with climate change." The fourteen species analyzed included: red maple (Acer rubrum), sugar maple (Acer saccharum), swamp birch (Betula alleghaniensis), paper birch (Betula papyrifera), American beech (Fagus grandifolia), white ash (Fraxinus americana), tulip tree (Liriodendron tulipifera), red spruce (Picea rubens), eastern white pine (Pinus strobus), black cherry (Prunus serotina), white oak, (Quercus alba), chestnut oak (Quercus prinus), northern red oak (Quercus rubra), and eastern hemlock (Tsuga Canadensis). This research was supported in part by the USDA Animal and Plant Health Inspection Service and the National Science Foundation. The Cary Institute of Ecosystem Studies is an independent nonprofit center for environmental research. Since 1983, our scientists have been investigating the complex interactions that govern the natural world. Their findings lead to more effective management and policy actions and increased environmental literacy. Our staff are global experts in freshwater and forest health, disease ecology, urban ecology, and climate change.